In Jean Giono’s beautiful ecological parable, The Man Who Planted Trees, a reclusive shepherd single-handedly, acorn by acorn, plants an entire forest in a remote war-ravaged valley in France. The waters return, the birds, the creatures; one man’s simple, daily act resulting, over decades, in a miraculous regeneration. So there is some delight in discovering that here in Hawke’s Bay, there really is a ‘man who plants trees’, a man who is making a regenerative difference, literally, acorn by acorn, with his project, the Himalayan Oaks Trust. For the last two decades, David Cranwell, a well-respected horticultural consultant, has been raising 1,000 Himalayan oak seedlings a year to plant on farms and orchards around New Zealand, anywhere he can find them “a home”, generating funds for conservation and children’s education in the Himalayan foothills of northwest India. 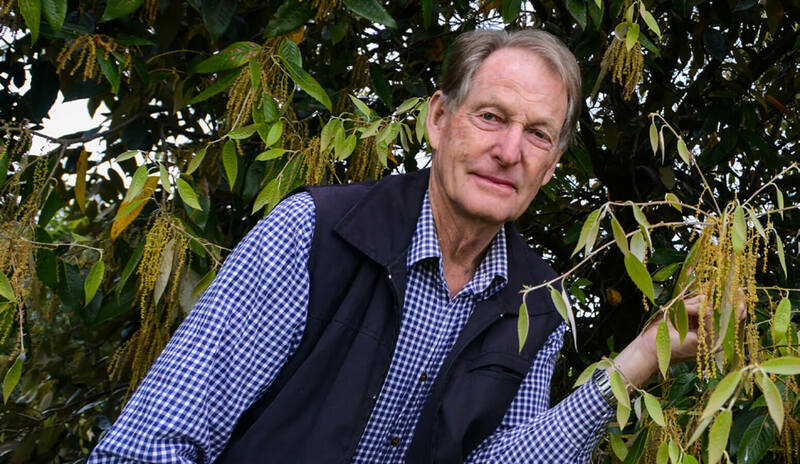 In the early, budding beginnings of spring, I sit down with David Cranwell in his riverside home near the Tukituki and he tells me his story – how his work with the Himalayan oak was more fate than choice, and why this tree is so special. It all began in the late 1980s when David spent a couple of days at the Eastwood Hill arboretum in Gisborne. Having what he describes as “an eclectic sort of nature”, David asked himself: “Of all the hundreds of species here, what would I have?” He had never seen a Himalayan oak before, knew nothing about it, but the oak tree that Douglas Cook had planted in the 1950s was the one that David, over the next three years, tried in vain to source for his own collection. Some years later, working for the Apple & Pear Board as a marketing manager, a role that involved extensive stints in China and travel around the globe, David was sent to India to undertake a feasibility study for a World Bank project in Utah Pradesh. Warned by a friend before he went, “Just be careful, India gets hold of some people and doesn’t let them go,” he laughed, “That won’t be me,” but it was. For David, it was “a life-changing experience”. Ranichauri – the steep hill country above the wealthier plains of Utah Pradesh – is called “the postal note state of India” due to the poverty and lack of prospects that see the men leave for the cities to find work, and the women left behind with seven or eight children, if lucky a cow or a goat, and no social security when the money wired through ceases to come. As it happens, the region is also home to the Himalayan oak, and what David saw of the tree that had once made such an impression on him, was “nothing short of tragic”. Thousands of hectares of oak forest had covered the hills for centuries, explains David, forming a unique, pristine ecosystem. “When the monsoon hits it filters through the leaf litter and subsoil, charging the springs. But with population pressure, fire, timber harvest etc, all that’s left now is grass – when the rains hit that, it roars off, gouges out the rivers, and the springs are dry.” A river bigger than the Tukituki has now completely vanished. Above 2,000 metres, the remaining oaks are like “enormous bonsai trees” – they’re “basically defoliated”, stripped for cattle fodder. Seeing the plight of the Himalayan oak, David was determined to do something. He sought permission to take acorns back to New Zealand, to grow and sell the trees to fund conservation work in India. New Zealand’s then Ministry for Agriculture and Forestry agreed he could import, under quarantine, a maximum of 1,000 acorns. So in 1995 under the guidance of Dr Sah, an ecologist at GB Pant University, local children gathered up the acorns and David sent back exactly 1,000. To keep his “interests alive”, David put forward a project proposal to the New Zealand Government: India is the seventh biggest apple producer in world; if we help farmers (e.g., with rootstock and pruning demonstrations), they won’t oppose New Zealand for access to the apple market. The Government approved three-years funding, but in reality, this was a 10-year project, with the outcome that in 1999 New Zealand was the fi rst country in the world to gain access to India for apple inputs. Alongside his apple work in India, David was working on his oaks mission. Recognising the importance of education, he had set up the Himalayan Oaks Trust in 1994 with the initial intention of financing a little school in Ranichauri, the proviso being that a conservation and tree planting programme be included in the curriculum. But his early efforts were stymied by politics – he couldn’t get the money directly to the school – and had to find another route. Since 2007, the Himalayan Oaks Trust has partnered with the Indian- based Himalayan Consortium for Conservation in the Himalayas (HIMCON), which oversees ground- level conservation projects, and with Manoj Pande, a trustee and chairman of HIMCON, who works closely with a small group of local women – women in India being key to effective change. In Ranichauri, the villagers have ‘GPSed’ where all the springs used to be, and have worked out that by planting around these areas, they can bring back the waters. The Trust has helped them build a reservoir by paying for the materials, with financial input from the New Zealand High Commission in India. Good works aside, the trees are proving to be incredibly successful in New Zealand and David says he has some great local support, with some landowners buying hundreds of the oaks over the years. “We’ve got trees scattered from Kaitaia to Bluff ,” he states proudly, while commenting that his son, who works in conservation, jokes about “Dad and his noxious weeds”. The landowner across the river planted 80 of David’s Himalayan oaks on a north-west scree slope in 1998-2000, with no irrigation, no support. Five years on, the trees were growing strong and well, which David says convinced him, if nothing else, of the tree’s value for Hawke’s Bay’s hot summers and drought- prone, steep hill country. The trees are tough, resilient, with roots that go straight down, and build a large canopy of evergreen leaves. These factors lend them a real value for soil erosion control and carbon sequestion, David believes, with myriad potential uses. They’re phenomenally fast- growing, with no diseases as far as he can tell, and “no bad habits”. We look out at the oaks across the Tukituki gully. There’s a shimmer of silver, as the pale, grey undersides of the leaves catch the light; it’s for this effect that in India they’re known as the ‘white oak’. In spring, they’re covered in little pink shoots, producing a “lovely foliage”, while the prolific, tiny acorns (ready in July) make “good duck food”. They’ve been trialled successfully as hedges for kiwi plantations – unpruned, they grow “big and bushy”, explains David, which is great for stock shelter, and “they can also be coppiced for fodder in summer if it’s really dry”. David has done his own experiments and suggests you can grow Himalayan oaks with kānuka and pittosporum between, providing mixed hedging and rich bee fodder. He’s been talking with Marie Taylor (Plant Hawke’s Bay) about using the oaks as nurse trees for natives. “With these summers we’ve been having, a lot of the young natives have been struggling, as they tend to have shallow roots.” But if you plant them beside oaks, their fast growth, companionability, and capacity to draw water to the surface, will offer both protection and nutrient. David is also working to convince forestry companies to plant oaks as filter belts for pinus radiata, especially in the gullies; then when they fell the pine trees, the oaks will stay, helping stem erosion. He’s donated 100 oaks to Farm Forestry to help pave the way. At 74 years old, David says he’s looking to pass on the baton, and acutely aware that “a lot of little trusts with great ideas fizzle out”. He’s working on a succession plan, but the morning I arrive he seems far from ready to put up his feet. Already he’s been on the phone to truffle specialists in Christchurch, organising to send down 100 acorns. “I’m always looking for ideas,” he explains, “and just today, I thought, ‘truffles, oaks’…. Truffles do well on limey hills like Hawke’s Bay … buy a Himalayan oak that’s inoculated and you might get truffles! It’s all about trying to get people interested enough to plant the tree so we generate cash for India. With well over 10,000 Himalayan oaks in New Zealand, David Cranwell has already planted a forest.